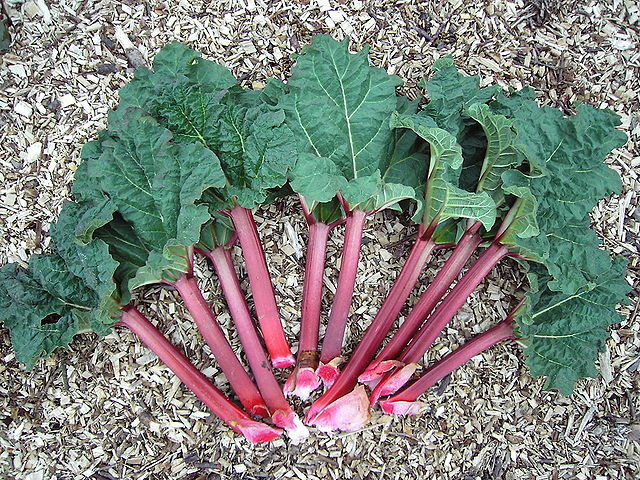 Rhubarb is one of those plants that has the mystical Fugu (Japanese blowfish) effect. That is to say if care isn't taken when dealing with it, you could end up being either severely poisoned, or worst still - dead! The problem with Rhubarb is that it contains the toxin ‘oxalic acid’, and although there are some small amounts present within the edible stalk, the highest - and most potentially dangerous - concentrations are found within the roots and leaves, which – of course - should never be eaten. However it is not always as simple as just described as certain environmental conditions - such as a severe frost – can have a damaging effect on rhubarb plants causing oxalic acid to transfer down from the leaves and into the edible stalks. For this very reason you should always remove any stalks that have had their leaves affected by cold damage, and place them onto your compost heap. The oxalic acid within the plant material is easily broken down by microorganisms as part of your compost heaps natural process of decomposition. During the Second World War, when the population of Great Britain was suffering from food shortages, the government, rather naively advised that Rhubarb leaves could be eaten in the absence of any other available fresh produce. Unfortunately there were a number of cases of acute poisoning resulting from this poor advice including several deaths. If small amounts of oxalic acid are eaten, the human body is normally quite capable of dealing with it. However, if more of the toxin is consumed over a reasonable period of time then you can expect to experience a number of unpleasant side effects. These would include weakness, burning in the mouth and throat, nausea, vomiting, diarrhoea and difficulties with breathing. Severe side effects would include convulsions, coma, and death from cardiovascular collapse. ARE CHERRY LAUREL FRUIT POISONOUS?